The 61-year-old’s sculptures possess a fierce, penetrating gaze that dwarfs the viewer. Walk into the foyer of the Bay area at the RMZ Ecospace in Bengaluru and your eyes will immediately be drawn to a solitary sculpture, whose sheer size dwarfs the entire space surrounding it. 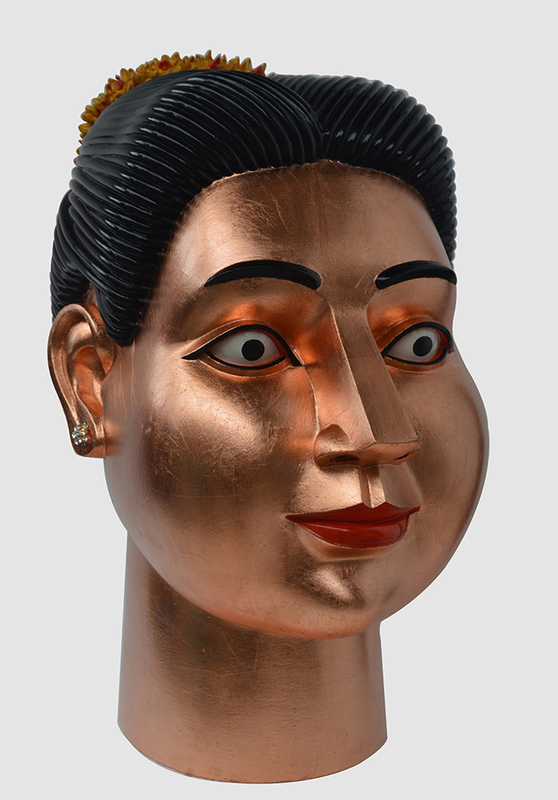 Standing close to 15-feet-tall (including the base), Devi is the most imposing and arresting of all of G Ravinder Reddy’s signature head sculptures. With golden skin, crimson lips, bulging eyes, a bun bedecked in jasmine buds, it is an incredible specimen of immaculate symmetry. 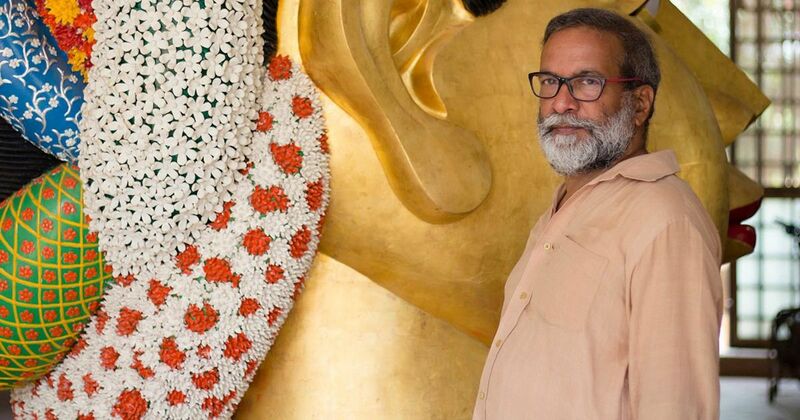 Seated in The Gallery, a non-commercial arts space set up by the RMZ Foundation, Reddy spoke to Scroll.in at the venue for his first solo show in over a decade. Titled Heads and Bodies: Icons and Idols, the show features 27 of his iconic works, crafted over the past two decades. But it is the apparent obsession with heads and size that are the dominant leitmotif of Reddy’s work. “The head is the immediate recognisable form for any human being,” said Reddy. 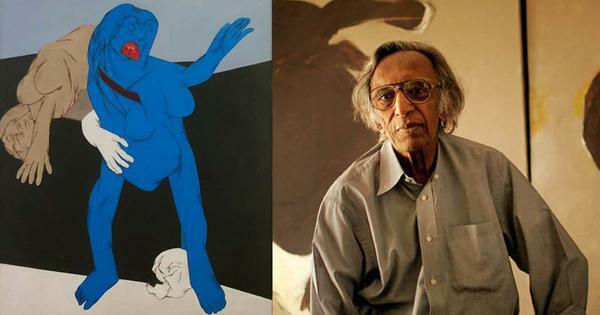 “So I said, why not do the head?” This thought was reinforced when Reddy was studying Art in London, after his Bachelors and Master in Fine Arts at the University of Baroda. A recipient of the British Council Scholarship, he visited a Nigerian exhibition of Benin Bronzes in the early 1980s where the small powerful heads modelled on chieftains had a powerful impact on him. 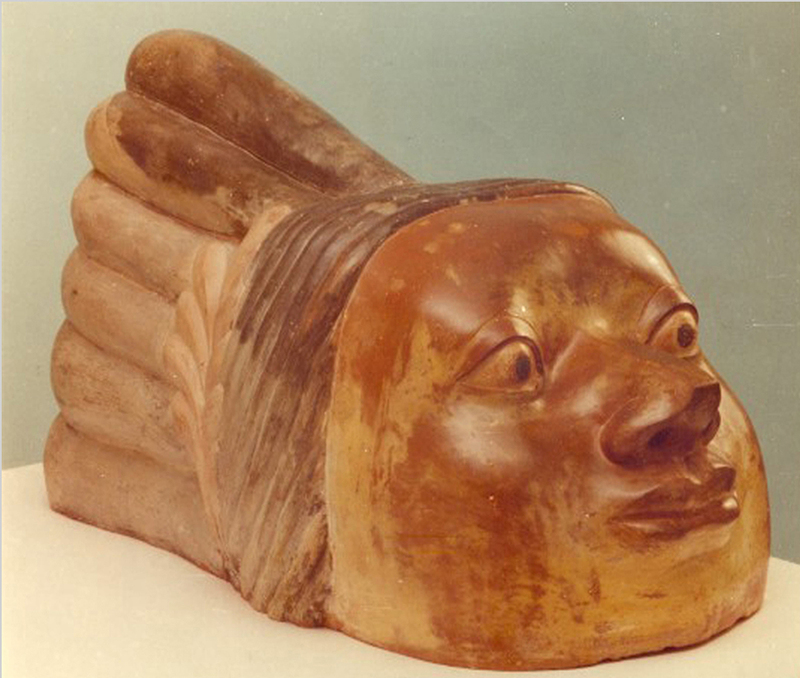 His initial forays included Mother Goddess sculptures and a few terracotta heads. Akshatyoni-III made in 1989-’90 of Terrasiglata (a process where oxide is infused into terracotta and burnished, giving it a glazed, reflective surface) followed. But he began to receive acclaim only after his work was displayed in New York in 1995 – the first three-feet-tall Devi. 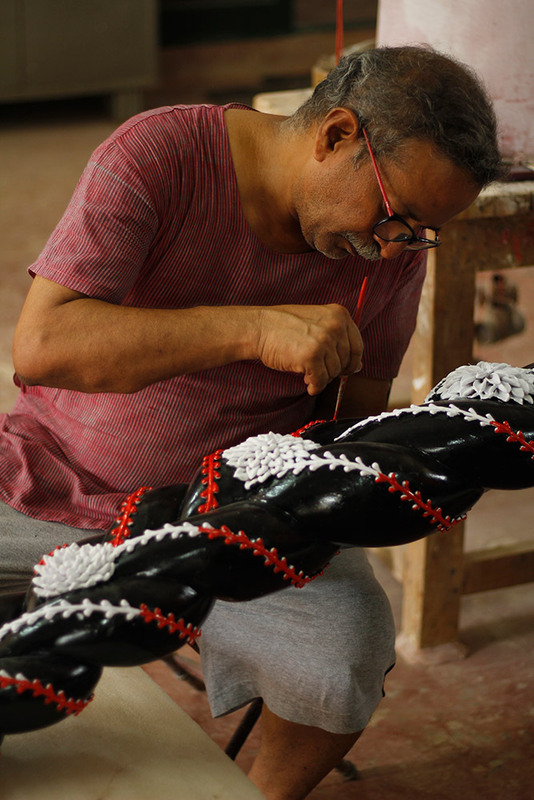 Reddy doesn’t design his sculptures on paper. His sense of symmetry is derived purely from vision and years of practice. Once he is happy with the form, he casts its mould in plaster of Paris and casts it in fibre glass, a departure from bronze, stone and wood, the materials that were the traditional favourites when he started out in the 1990s. “The need [to use fibreglass] arose mainly because I felt people were not looking at the sculpture, they were looking at the material. Fibreglass has no colour or history behind it, it can take any shape and form. I am interested in concept and presenting it, not the material.” Being light and comparatively inexpensive, it also allowed him to work at the scale he envisaged. Reddy’s palette features gold, red, yellow and blue. Gold, as a skin colour, looks rich and has a “religious significance to its turmeric hue,” he said. The gaze of Reddy’s women – whether its Devi, Krishnaveni or Woman Holding Her Own Hair – is arresting. Always looking straight, bold, pliant, sensual and demanding, all at the same time. Reddy says he always wanted the eyes to make the viewer feel a little dwarfed by their sheer penetration. 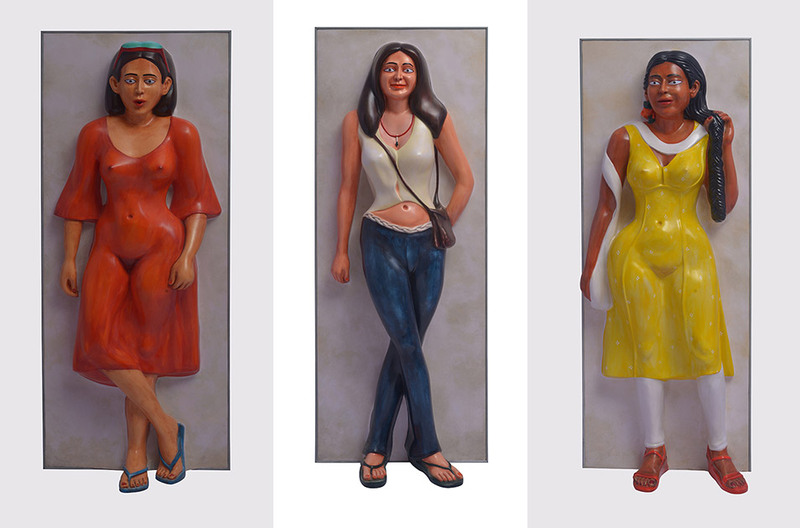 Reddy’s work has often been described by critics as the blending of pop culture and religion, the fusion of contemporary pop art and Hindu sculptural tradition. He said he draws inspiration from the Gupta, Maurya, Amravathi and Chola dynasties, West African murals and the Yakshi-like forms of the Kushan and Mathura styles. Reddy pauses for a minute, as he watches the art handlers unload one of the heads from a huge crate, the layers of bubble-wrap adding to to its already magnificent size. Does he see his scale expanding even more hereafter? Age will play a role, he admits, in his future pursuits. “Now I am limiting myself to human scale, I am thinking to put a body of work of just figures based on man woman and child, hopefully next year,” he said. 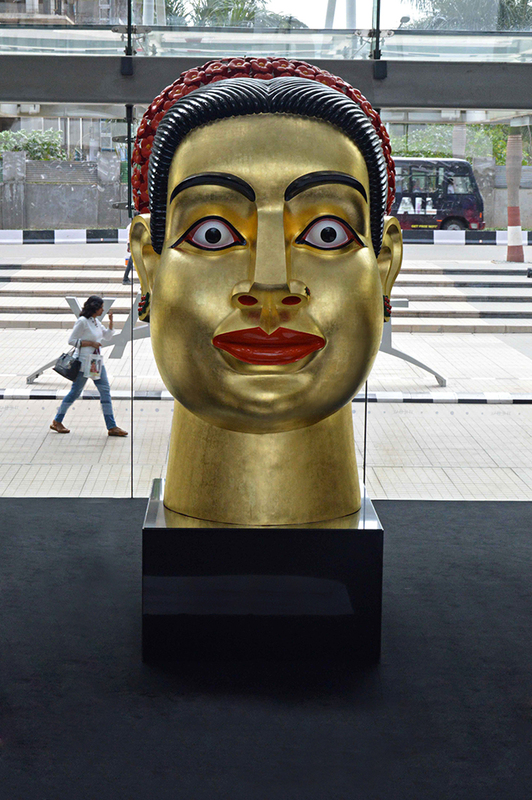 Heads And Bodies, Icons And Idols is on exhibit at The Gallery, RMZ Ecoworld, Bengaluru, till September 9, 2017.